Greetings again from the darkness. Much was made of the ‘artistic license’ director Mel Gibson took in creating his own version of historical events and actions of William Wallace for his Oscar-winning BRAVEHEART (1995). Director David Mackenzie (in his follow up to the excellent HELL OR HIGH WATER, 2016) pays a bit more attention to historical details as he picks up the story at the end of Wallace’s rebellion – and the beginning of the uprising led by Robert the Bruce. 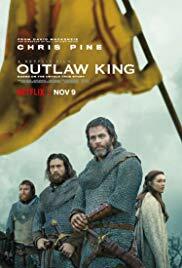 Chris Pine plays Robert the Bruce, a man forced to pledge loyalty to Kind Edward I and England prior to leading the rebellion. It’s the year 1304 and director Mackenzie’s opening sequence is a several minute long tracking shot that is simply superb. It features our introduction to Robert the Bruce (Pine), King Edward I (Stephen Dillane) and Prince Edward (Billy Howle, ON CHESIL BEACH), as well as an early swordfight and an eye-popping fireball shot from an enormous catapult into the protective wall of a distant castle. Not long after, we learn William Wallace has been killed, the King has provided Robert the Bruce a wife in Elizabeth de Burgh (Florence Pugh, LADY MACBETH) and Robert takes the life of fellow Scotsman John Comyn … an act that costs him dearly in the early going. However, it does lead to his being named King of Scots by the Church, and he slowly begins to build his forces. Of course, Scotland’s forces are always dwarfed in numbers by that of the English Empire, but never in spirit. The two words of the title are actually separated by a slash in the opening credits; a device meant to emphasize the dual sides to the man and his actions. In addition to that opening long shot, there is a visually stunning sequence of a nighttime raid on a camp site. Unfortunately after that, we get mostly mud and blood, including the pivotal Battle of Loudon Hill which features the ultimate in home field advantage. There are some terrific costumes and set pieces, but mostly it’s elaborate and detailed moviemaking (with a few downright silly moments) that never fully clicks. Perhaps that’s a factor of having 5 different writers involved. With many familiar faces from “Game of Thrones”, it will be interesting to see how this plays on laptops and TVs via Netflix. Another Robert the Bruce film is scheduled for theatrical release in 2019, and the inevitable comparison will be made at that time. This entry was posted on Saturday, November 10th, 2018 at 4:11 pm and is filed under Action, War. You can follow any responses to this entry through the RSS 2.0 feed. You can leave a response, or trackback from your own site.